Got my order yesterday. 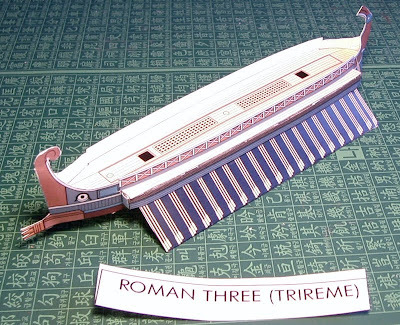 Already went to Staples this morning & have the Roman Navy ships printed to 60lb paper. Eric recommends 67-80lb paper, but Staples only had 60 & 100lb. I could glue it to regular paper which is 20lb. I may do this for the deck. I had the PDF rules printed & spiral bound with protective covers. Also, had the QRS sheets laminated. 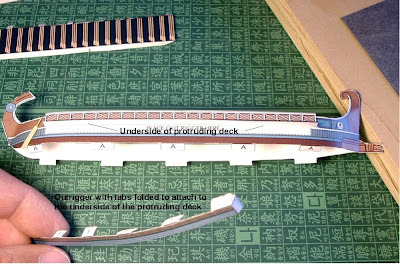 I've read over the construction for the ships and it seems pretty straight forward. Just need to get a good cutting surface. My normal mat for painting has a lot of crud on it - like dried paint & glue that would likely screw up any straight-edge cutting. 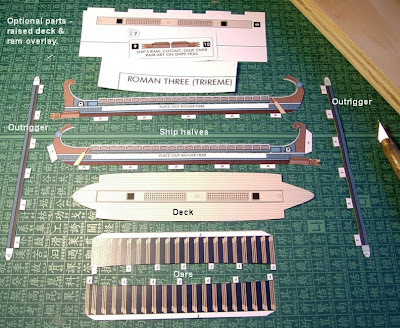 After I glue the ships together, I'll go to Joann's or Micheal's for card matting to use as bases. 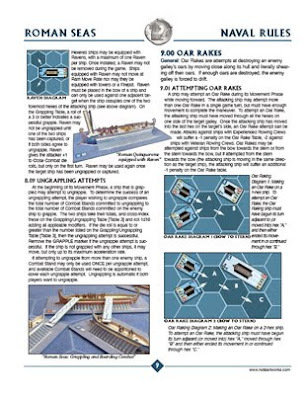 The mat I ordered uses 5" hexes; that's what Eric recommends for 1:300 scale; and the size he used at Enfilade. I'll probably get another 6' X 4' mat; one seems so small compared to the three Eric used at Enfilade. However, I don't have a table large enough for two right now. I will try to post a Work-in-Progress, as this project moves along. I finally got around to finishing these guys. These figures were among other Redoubt Trojan War figures I won off of ebay several years ago. They're a little too big to put on the chariot bases I use, so they'll be individually mounted. I'll probably just place them on the battlefield for looks. 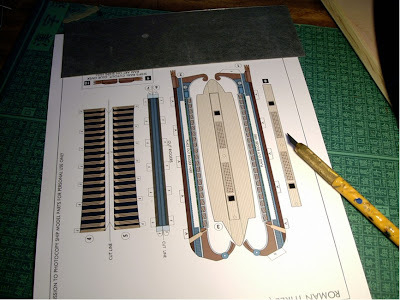 Wow - I was just surfing the 'net and wanted to see what was new on Eric Hotz' Roman Seas, and lo and behold, his rules have been released. 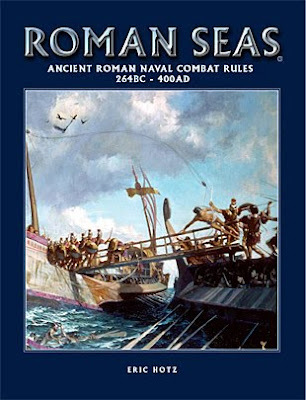 Here's the description of the rules: Roman Seas is a fast-paced, dynamic, multi-player miniatures game designed for use with 6mm (1/300th) scale ship models and miniatures, and played on a hex grid game board. 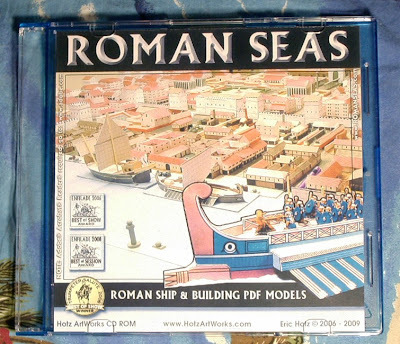 Roman Seas is designed to allow each player to control a squadron of two to ten ships. 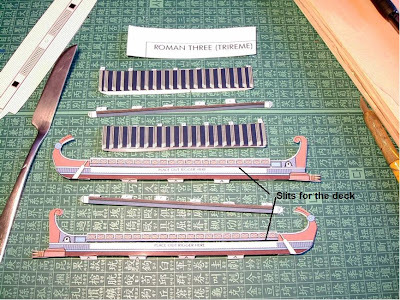 Players will be able to recreate small naval actions from the start of the first Punic War when Rome constructed its first major fleets (264 BC), to Actium (31 BC), to the effective end of the Roman Navy (400 AD). Here's the cover of the book (the illustration is also in the old National Geographic book "Greece and Rome"). Here's a page from the rules (available hard copy now; PDF version should be available soon). I was fortunate enough to get to in on a game at Enfilade this past May. When asked about his rules, I recall Eric saying it was in the works. To me, it sounded like it was a ways off - which disappointed me, as I really enjoyed the game. I liked the mechanics, as well as the great-looking ships and terrain. 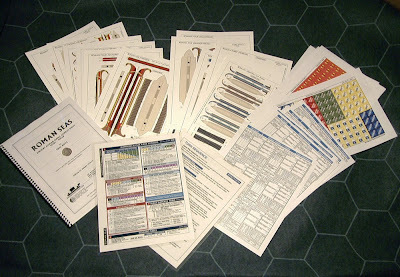 As most folks know, the ships and gaming aids are printed on card stock and have crisp, clean detail. 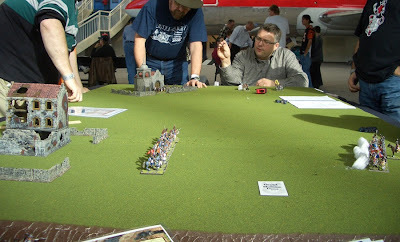 He also had 6mm figures on the decks, which are a perfect match and only add to appeal of the game. Dan & I hosted a Sharp Practice game this afternoon at the Museum of Flight up on Seattle. 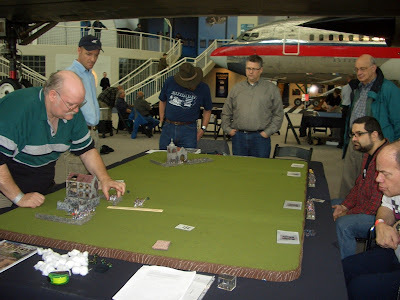 We represented the Puyallup (War)gamers, along with other NHMGS members. 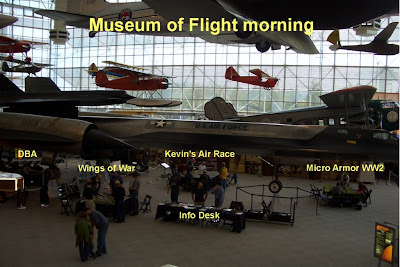 There were some DBA games, a Wings of War aerial combat game, Kevin Smyth's air race game, and a Micro Armor WW2 game - besides our game. This was my first time at the museum, and it is a very nice and interesting place. The NHMGS have been able to host games there for several years, and I believe they always get to set up under the SR71 Blackbird. Since I was fairly busy GMing the game, along with Dan, I was only able to take a few photos. As you can tell, the set up is pretty much the way we've play-tested the game. Basically, the French in garrison and the British coming on the table via blinds. We decided on minimal terrain to allow the two sides to engage as soon as possible. We did manage to get all the basic rules gamed - that is, movement, firing, and a few rounds of fisticuffs. Although this was the first Sharp Practice game for the players, their previous gaming experience really helped out, as they pointed out a few items which Dan & I hadn't tried out before. One was the tests to see if Big Men were hit while attached to formations. All in all, it was a good time and time well-spent. Aggressive opening moves by the French right - the British were later spotted & blinds removed. French commander of the garrison at the church ponders the use of his voltigeurs and other troops. 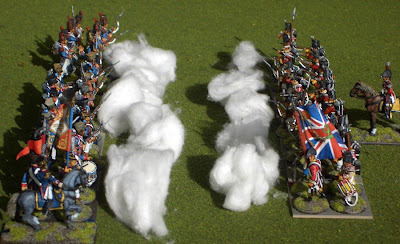 The French and British on this end of the battlefield were both very aggressive and quickly formed groups into formation and advanced to close range. Admittedly, both sides had poor marksmanship (er, dice rolls) and ended up giving each other plenty of shock points, but very few kills. This was the first round of fisticuffs initiated by the French. A couple more rounds led from either side followed. Which resulted in a few more kills and shock points. As stated previously, these guys weren't afraid to cross bayonets. I painted these figures yesterday - actually off-and-on until late into the night. Excellently sculpted and very rugged for the gaming table. 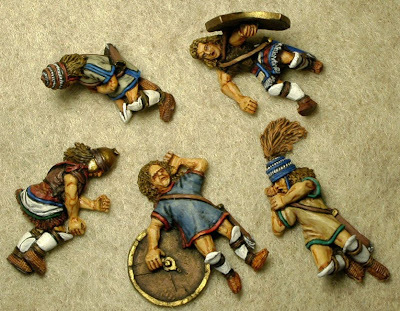 Again, these are pretty much wargame standard - no eyes painted. I'm looking forward to using them with my Macedonian army. 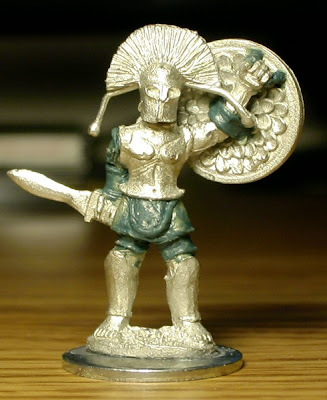 I also have a unit of late-Thracian javelin men with oval shields to work on - also from Crusader. Looking at the pictures, I realized I forgot to paint the metal cloak pins - they're painted now. 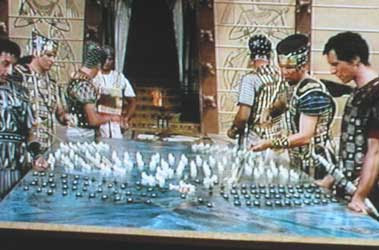 The shields designs were also based on known patterns. I used LBM transfers which I had left-over from an earlier project for some of the shields. 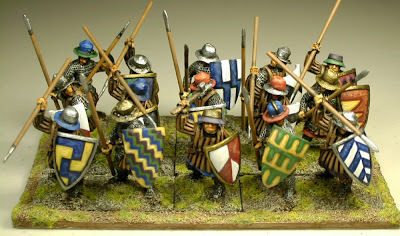 Here are some Norman Bowmen from Crusader. Nice sculpts and fairly easy to paint since they're wearing mail hauberks with only a few areas of exposed clothing. I actually managed to finish them in a few hours yesterday & finished flocking their bases this morning. The mail is well detailed & only needs a light dry-brushing of silver over the black undercoat. The faces & hands were give a light flesh coat and wash of Vallejo ink/stain. I don't paint eyes anymore for figures intended primarily for gaming - which speeds up the work tremendously. These guys will be a welcome addition to my Norman army, which up till now had only crossbowmen and two-handed axemen as infantry. The crossbowmen usually perform well, but since they can't move & fire, these regular bowmen will be a nice complement. 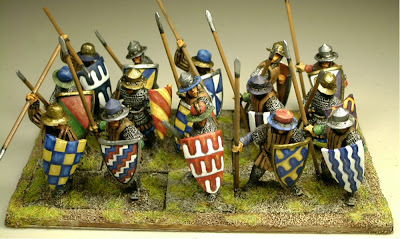 I also plan to use them in my next army - an Early-Feudal/Clerical German army. Just finished the shields for these guys who will be core infantry for a Feudal WAB army. They are in heavy armor with large shields and have thrusting spears. The two units are mixed-ordered formation with crossbowmen. 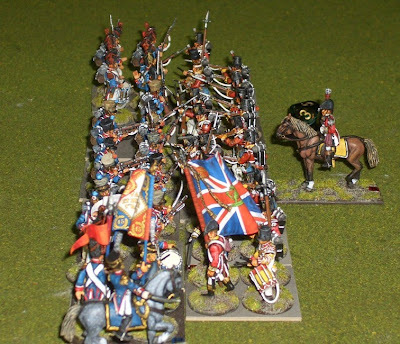 I already have crossbowmen which I use in my Norman and French HYW armies. I suppose I should get some banners for the combat bonus. I'll probably work on the light cavalry unit next, and save the mounted knights for last. This is a 1st Corps Spartan Hoplite leader that I thought was too short. So, I sawed him in half at the top of his greaves & then added pins to increase his height. I also added some ancillary armor to his right arm, thighs, and groin - using Green Stuff. 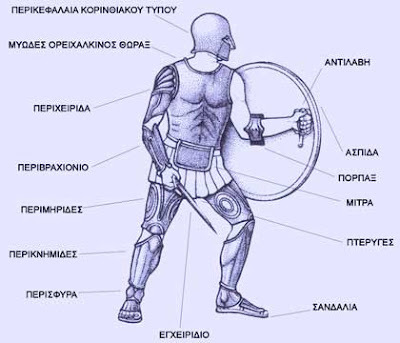 There are statuettes showing this type of armor worn, as well as actual surviving pieces in museums - even armor for the foot and ankles. It is believed these items were worn in the Archaic period - probably not worn by the time of the Persian Wars. However, maybe some leaders still wore it on occasion. I recall an Alexandrian Successor general wore double armor in battle.